came back about ten oclock. I took Mothers horse in the afternoon. I had a letter from Will and wrote to him. Fred Stevens came home with me and took the horse & buggy to the valley. It set in to rain about five oclock. This is the night for the reception at Aunt Ems for Willie and his wife. 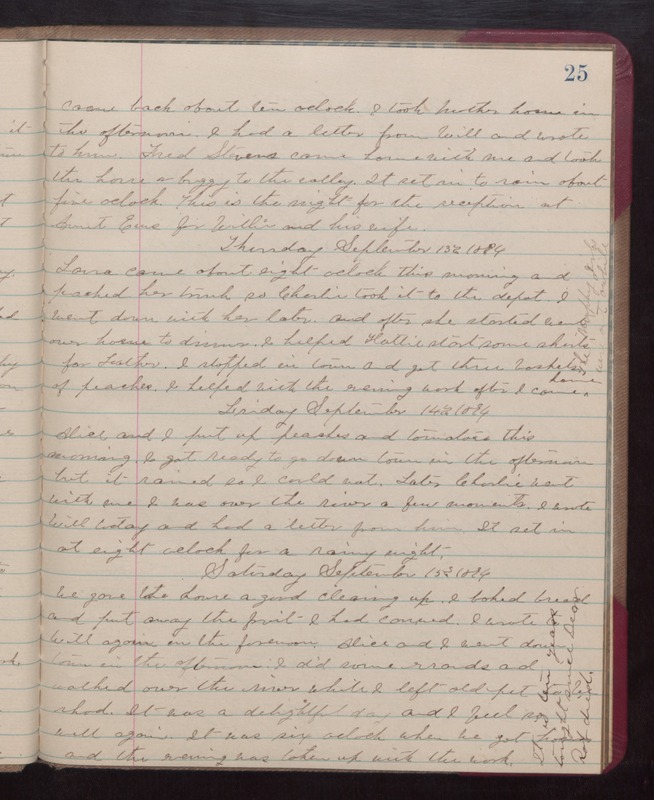 Thursday September 13th 1894 Laura came about eight oclock this morning and packed her trunk so Charlie took it to the depot. I went down with her later and after she started went over home to dinner. I helped Hattie start some shirts for Father. I stopped in town and got three bushels of peaches. I helped with the evening work after I came home. [the following is written vertically in the right margin of the above entry] The Murphy girls were out awhile. Friday September 14th 1894 Alice and I put up peaches and tomatoes this morning. I got ready to go down town in the afternoon, but it rained so I could not. Later Charlie went with me I was over the river a few moments. I wrote Will today and had a letter from him. It set in at eight oclock for a rainy night. Saturday Septmener 15th 1894. We gave the house a good cleaning up. I baked bread and put away the fruit I had canned. I wrote to Will again in the forenoon. Alice and I went down town in the afternoon. I did some errands and walked over the river awhile. I left old pet to be shod. It was a delightful day and I feel so well again. It was six oclock when we got home and the evening was taken up with the work. [the following is written vertically in the right margin of the above entry] It is ten years tonight since Dear Rob died.